Lab2; used briefly as a location for the beam fraction sensor (BF3) to autolog. 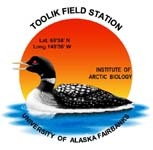 This site is located on the shore of Toolik Lake behind the Lab 2 building. It was chosen for convenient access, though ultimately was changed because of the prevalence of nearby structures.